Here’s why most of us would enjoy teething baby memes: These teething babies look simply adorable! They have just started growing their teeth, so they look extra goofy when they smile or laugh. Some of these teething babies would even remind us of rabbits, and understandably so. You see, memes about teething babies will also appeal to parents – and not completely in a positive way! When babies are in this growing process, they start getting a little pesky and fussy. Their gums hurt, and these babies start to cry and bite to relieve their discomfort! Every new parent would be more than happy to rant to you about their own teething babies – it’s never easy dealing with them. There’s no easy way around it either! It’s alright, we understand. We know how it’s like. You see, we have compiled a list of memes about teething babies for you, so that you can share them around with other parents who are also dealing with their own babies in that stage! 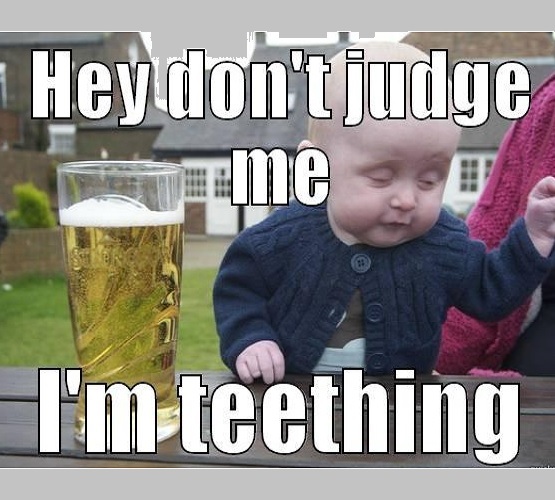 If you can’t beat it, you have to join it – and this is what we strive to do by sharing these teething baby memes with you. Laugh away the pain and frustration of dealing with a baby today! 1. Hey Don’t Judge Me, I’m Teething. 2. You Mean To Tell Me I Have To Suffer Through Teething Pain. And Then Pay Someone To Tear Them Out Of My Gums When I’m Older? 4. When It’s Your Spouse’s Turn… To Tend To The Teething Baby At Night. 5. Brace Yourself… Baby’s Teeth Are Coming. 6. We Have Some Teething Issues. But Other Than That Everything Is Great. 7. How Do I Put This? I’m Teething. 8. When Your Baby Wants To Nurse But Is Teething. 10. She Put Ice In My Mouth For Teething? I Want Her Body Put On Ice Tonight! 11. “Oh Please!” “Wake Me Up Every 2 Hrs When You’re Sick And Teething!”. Said No Mother Ever. 13. I’m The One Teething. So Why Are We Both Crying? 14. Having Hard Time Dealing With Teething Baby That Never Ever Stops Crying. Stops Crying 24/7, Is Now A Miniature Of Myself, Everyone Was Right, Things Are Getting Better. 15. The Baby Is Teething. Now, I Can Realize Why Some Animals Eat Their Young. 16. Mom, I’m Sorry I Hurt You With My Teeth. Just Kidding… I Don’t Care. 17. Teething Babies Are God’s Birth Control For Humanity. 18. Yeah, I’m Tething Too Billy. That’s No Reason To Call Off. Now Come To The Office Before I Finish My Food. 19. How You Feel After A Night With A Teething Toddler. 20. Life Goals When You’re Teething. Were the memes relevant for you? We sure hope that they are! After all, sometimes it’s only through images like these teething baby memes that you can share your thoughts and parenthood experience. Know a mum or dad who’s dealing with a teething baby recently? Share these memes with them and watch them agree with you immediately!